In recent years, Iran has been no stranger to political strife and friction. With the success of Ayatollah Khomeini’s 1979 Islamic Revolution, Iran transformed from a Westernized monarchy to the Islamic world’s only theocracy. Since then, the nation has been ruled by the Shiite Islamic clerical class under the leadership of the Supreme Leaders Ayatollah Khomeini (1979-1989) and Ayatollah Khamenei (1989-present). 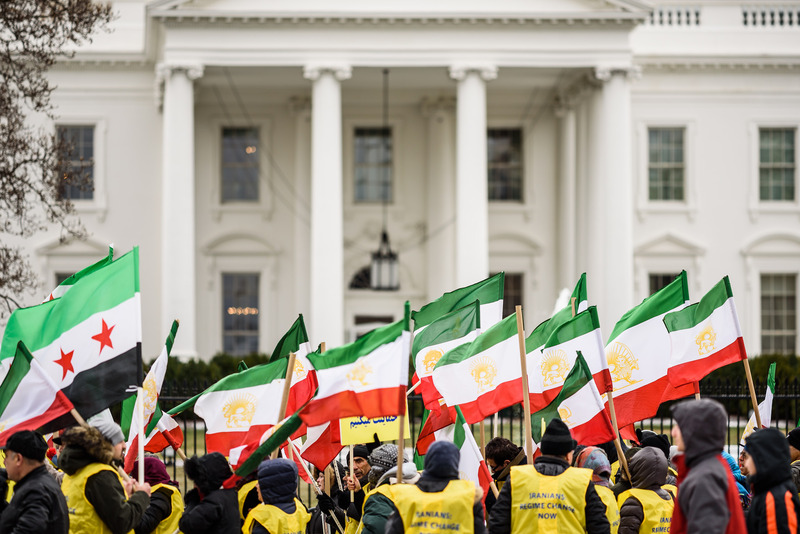 However, over the past few years, the revolutionary passion that fueled Iranian civil society has eroded, with the current generation of Iranians growing frustrated with Tehran’s economic mismanagement, political repression, and widespread corruption. In 2009, protests broke out in Iran after then-incumbent President Mahmoud Ahmadinejad won a “crushing victory” in the Presidential election. However, the result was contested by challenger Hossein Mousavi, claiming that the election was rigged; sparking the anti-establishment 2009 Green Movement. The movement reached its height when three million demonstrators took the streets of Tehran to protests the election’s results. According to Abbas Milani, the director of Iranian Studies at Stanford University, the protests embodied the Iranian people’s quest for “democracy and peaceful change”. On February 14th, 2010, Tehran cracked down on a Green Movement organized a protest; which resulted in the movement fizzling out as its activist leaders were systematically arrested and jailed. The Green Movement ultimately did not lead to much social or governmental change in Iran. 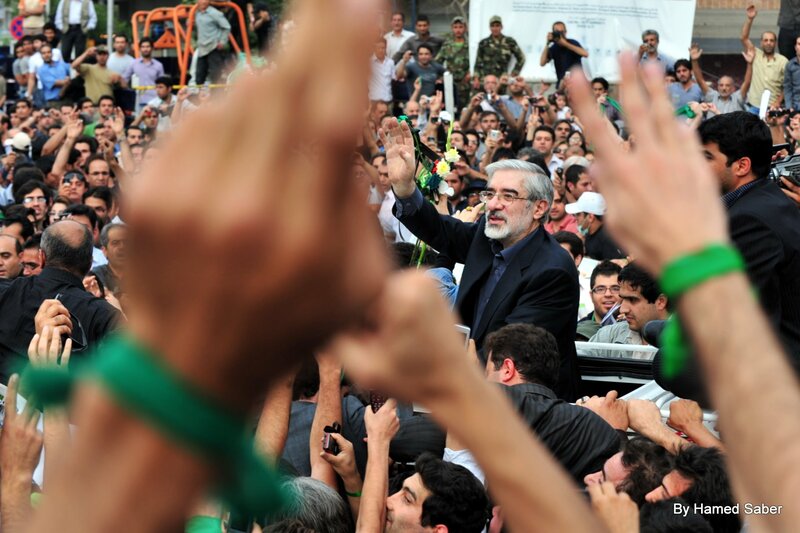 Green Movement leader Hossein Mousavi leads the crowd in a moment of silence during the 2009 protests. This past December, widespread protests began to spring up across Iran, showcasing the largest public display of discontent with the Khameini regime since 2009. The protests were sparked by institutional corruption and the poor economic dividends from the 2015 Iran Nuclear deal. The 2015 deal was struck between Iran, the US, the UK, Germany, France, Russia, and China. The framework of the deal lifted devastating economic sanctions placed on Iran for their development of nuclear weapons. Hassan Rouhani, the incumbent President of Iran, claimed that the lifting of sanctions would increase foreign investment and kickstart the Iranian economy. However, the economic benefits of the nuclear deal have not been as great as originally hoped. While Iran’s real GDP is scheduled to grow by 3.8% in 2018 , according to the International Monetary Fund, its growth has mostly been driven by new oil sales. The IMF accounts for this growth as due to, “stronger domestic demand in oil importers and a rebound of oil production in oil exporters”. Furthermore, unemployment among young people is over 24 percent. Hassan Rouhani made bold economic promises and the deal’s failure to deliver has caused unrest. The protests began on December 28th, in the conservative city of Mashhad and have since spread to over 80 cities across the nation. So far, the protests have led to over 3700 arrests and 25 deaths. 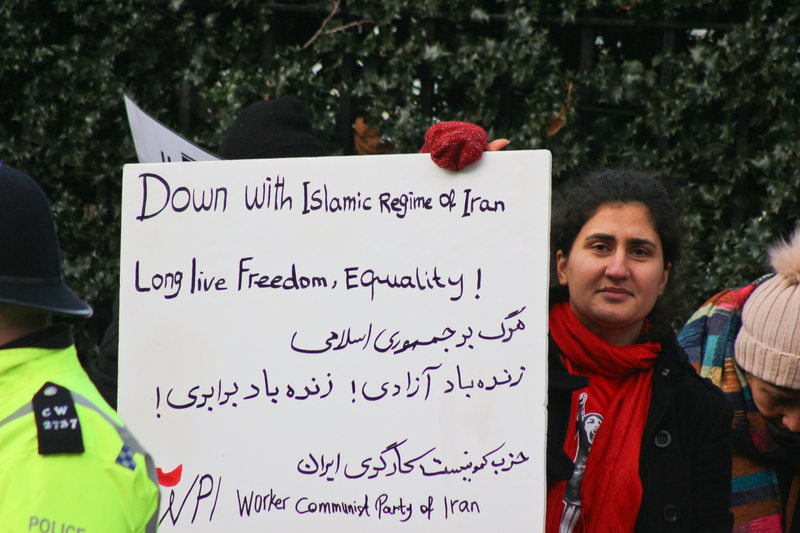 This contrasts the 2009 protests which were mostly limited to Tehran. The new wave of protests are also nowhere near as large as the 2009 protests which numbered in the millions, whereas the recent protests have been estimated to be in the tens of thousands. Another important distinction between these protests and the 2009 protests is organization. The 2009 protests were headed by former Prime Minister (1981-89) Hossein Mousavi. The protests had specific political goals and plans for a reformed Iranian government. The current protests have no such level of organization. Some protests have challenged the Supreme Leader of Iran directly. The protestors were heard shouting “Death to Khamenei”. However, the 2017 protests have had no such level or leadership or organization. According to Trita Parsi, the founder and president of the National Iranian American Council, the protests have no clear leader or goals. Rather, the protestors have ranged from people with economic grievances to religious hard lines trying, seeing the opportunity to increase their political power. These sporadic protests are not as organized or powerful as the protests of 2009, which eventually failed to change the political status-quo in Iran. The most recent protests in Iran have petered out. The infamously brutal Islamic Revolutionary Guard Corps(IRGC) was dispatched to quell the protestors with mass arrests and brutality. The government was successful in quashing the protests and they now appear to be over. Much like the 2009 protests, the 2017 protests have failed to drive change in Iran. However, are there any reasons for vulnerability in the Iranian government? A growing problem within the Iranian government appears to be the growing divide between Iran’s elite political factions. The collective response of the various branches of the Iranian government has been incoherent and disunified. Rouhani’s Centrists, the Reformists, and the Supreme Leader have responded differently to the protests; highlighting a widening gap between Iran’s factions, which have held office together since the 1979 Revolution. Surprisingly, President Hassan Rouhani defended Iranian’s right to protest, saying, “We are a free nation, and based on the Constitution and citizenship rights, people are completely free to express their criticism and even their protest”. Since then, President Rouhani’s response to the protests has been subdued. He admitted that the driving force behind the unrest was “distance from the younger generation.” Rouhani called for government transparency and greater access to the internet, finally following up on his 2013 campaign promises. However, whether or not Rouhani has the political strength or ability to implement these reforms is another question. Supreme Leader Ayatollah Khamenei was quoted as saying, “in recent days, enemies of Iran used different tools including cash, weapons, politics and intelligence services to create troubles for the Islamic Republic”. Khamenei does not acknowledge the root cause of the protests, but instead blames the West for their political strife. The Supreme Leader’s comments are a dismissal of the Iranian people’s struggles and his inability to recognize them will ensure that reforms are not made. Iran’s other political faction, the Reformists, did not make a strong statement in regards to the protests. The Reformists are a political faction in favor of reforms that increase freedom and democracy within the Iranian political system. A prominent Reformist is former Iranian president Mohammed Khatami. A Reformist, Mohammad Ali Abtahi wrote on Instagram, “stirring up social problems and encouraging street protests will be, more than anything else, to the detriment of the people who live inside Iran”. It appears that the Reformists have appeared to support the government, while not overtly endorsing the protests. Thus, Iran’s three major elite factions have struggled to act coherently and in harmony. It is possible that divisions in the government, exacerbated by these most recent protests could continue to grow. If Rouhani pushes for reforms, while the Supreme Leader continues to hold his xenophobic, ‘ignorance is bliss’ positions, Iran’s government could face internal turmoil. A fragmented Iranian government could quickly become the root cause of external problems. The Iranian people have been demanding more freedom and better economic opportunities. What if the Iranian government is unable to deliver change and improve the country’s economy? It is possible that further economic collapse could further mobilize the people against the Iranian government. The 2017 protests will not be the one that overthrows the Iranian government. The protests inability to organize and take root in Tehran, coupled with the Iranian government’s draconian response has led to their failure. However, there are reasons for political vulnerability within Iran. The growing divide within the government could spark internal chaos, which could cause the government to collapse from the inside. Furthermore, if Iran’s economy does not improve, more protests will occur. If new protests are injected with leadership and organization, they have the potential to become larger and more effective. Indeed, it is hard to imagine the Supreme Leader losing power in Iran, but the fact that this grassroots protest was able to spread across Iran to over 80 cities, illustrates the Iranian people’s increasing revolutionary fervour. The 2009 protest was limited to Tehran and were a response to an election. These recent protests touch upon deep-rooted economic, social and political issues. The political stakes are intensifying. More gasoline is being poured on the fire in Iran and the right spark could ignite a more incendiary and violent protest movement.